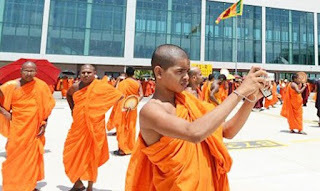 Days after the visit of Prime Minister Ranil Wickremesinghe, the Indian government is examining a proposal to relax the visa regime for Buddhist monks from Sri Lanka. More than 55,000 monks visit India every year on employment visa to work in monasteries at New Delhi, Dharamshala, Varanasi, Kushi Nagar and Bodh Gaya, said officials. As per the rules, monks are required to pay a visa fee of $150 for employment permit every year.